In effort to educate fellow students and the community at large about the food supply chain, as well as support local and sustainable agriculture, some students at Brevard College have formed BC E.A.T.S. The acronym stands for Environmental Action Through Sourcing. Brevard College student Molly Riddle, one of the founders of the group, has long been interested in agriculture. When Riddle was in high school in Burnsville, she helped her family raise eights pigs. Riddle said farming takes a great deal of time and there is little money to be made. She said feed can be costly and pigs like to eat. 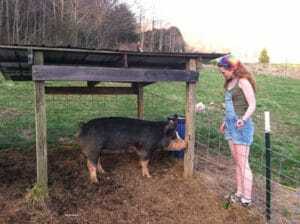 One of the biggest challenges occurred when one of the pigs would get out and there would be no one else around to help her corral the loose animal. “That was an adventure,” she said. Those adventures and interest in farming led her and other students to begin making a connection between Brevard College and agriculture. She and another student attended a Real Food Challenge conference earlier this year in Chapel Hill. To participate in that program, however, students had to commit to having 20 percent of their campus’s food coming from local farms that implement humane, sustainable and fair trade practices by the year 2020. After realizing the difficult challenges in meeting that goal, the students decided to take the knowledge they obtained at the conference and go their own way. “That’s when BC E.A.T.S. started,” said Riddle. The group then created a Facebook page and then made a survey available to all students. “They felt like it was something that was overdue,” said Riddle of the organization. The group then began to hold meetings, first for students and then students and faculty. The next meeting, scheduled for April 5 at 7:30 p.m. in room 115 of the McLarty-Goodson building, is open to the general public. Dr. Robert Cabin will be discussing sustainable farming. While organizers are focusing on education and establishing a foundation for the organization this semester, one of the ultimate goals is for the college’s Myers Dining Hall to receive a significant portion of its food from local farmers who follow sustainable, fair trade and humane practices. “Sourcing the food is what we want to focus on,” said Riddle. But backtracking food from the college cafeteria to where it was grown can be a long and difficult process. Organizers have used online tracking tools and talked to cafeteria staff about the source of the food. Riddle said BC E.A.T.S. is also working with the college’s two main food suppliers, Sysco and Marvin’s, which respectively supply the college’s meat and produce. Riddle said once BC E.A.T.S. finds local farmers who meet their restrictions, they will then work with the two food suppliers to see if some of the food cannot be obtained from local farmers. She said one of the main concerns for the food suppliers is that local farmers be properly certified, primarily for safety concerns. She explained that if the college serves contaminated food, then both the college and the food supplier could be responsible. “This is very definitely the beginning stages of all of this (sourcing) ,” said Riddle. Other long-term goals include helping the college promote and establish an agricultural education program that could include a greenhouse and gardens. The group also has short-term goals. Riddle said a goal for next semester is to have the college begin receiving its apples from neighboring Henderson County. “As far as we know, the apples now come from Washington,” said Riddle. The group also is hoping to implement a composting and recycling program next semester. Once the shorter-term projects take hold, the hope is that more students will see what is being done and become involved as the scope of the projects expand. “We’re in a great place to do it,” said Riddle. “We’re surrounded by people who are willing to work with us.